"I’ve actually been meaning to give a shout out to this blog for a while. 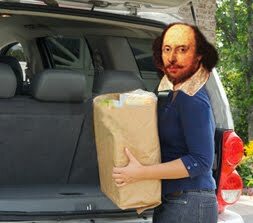 Everyday Shakespeare is just hysterical fun for those of us squeezing our love of amazing Early Modern literature in between grocery runs, reading verse while dodging the mac and cheese being tossed at us, pondering poetry to soothe ourselves after a stressful day, and, of course, hauling the Norton around everywhere we go because we’re never sure if we may have an emergency reference situation. I especially suggest the Tuesday segments where the magic Shake-ball comes out to answer all your burning questions. Check ‘em out."